I was surprised to see this organic wine in the local bottleshop, but what attracted me to it was the label – Battle of Bosworth. Just why would an Australian wine be named after a battle fought in England in 1485, ending the war of the Roses between the Houses of Lancaster and York? (More complicated than that but this is not a history lesson). And what was that yellow flower on the label, when the roses in the aforementioned war were red or white? Read on and all will be revealed. It turns out that the wine is made by a guy called Joch Bosworth, so the name was somewhat obvious and irresistible. So what about the flower, when we were expecting a white or a red rose? That’s where it gets complicated. 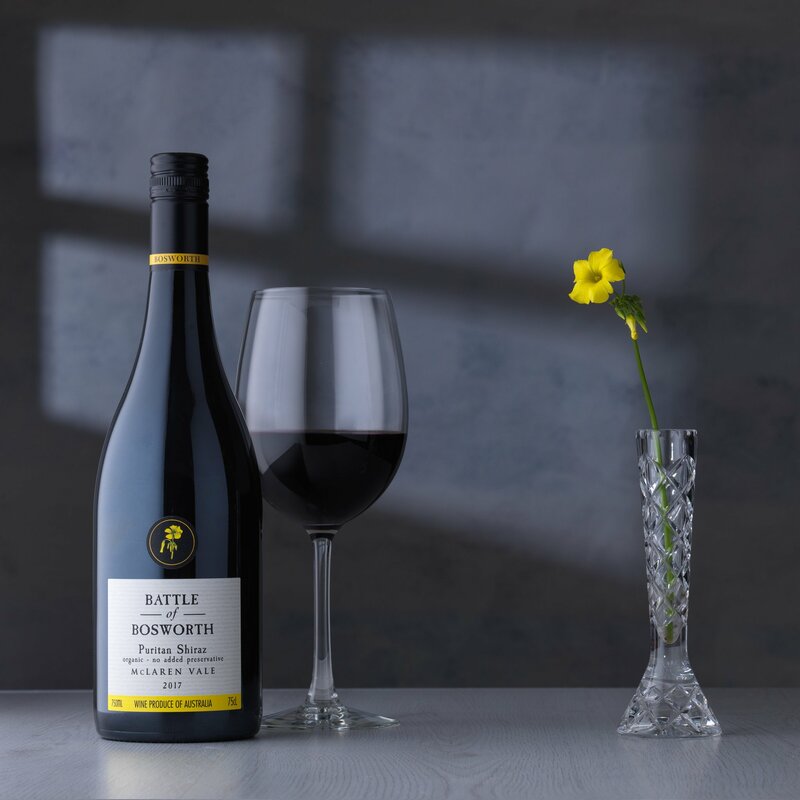 Bosworth’s vineyard has been an organic enterprise for many years. There is a strict standard for organic agriculture, which varies a little from country to country, but basically it means no chemical fertilisers, no herbicides (weedkillers), and no pesticides. I’ll come to the question of sulphites in wine production post harvest later. So we find that organic vineyards use composts and manures as fertilisers, minimal tillage to avoid destroying soil structure, and a systems approach to pest and weed management. By understanding the vineyard as a system, it is possible to manage insect populations for instance, discouraging the unwanted and encouraging their beneficial competitors. Now to the sulphites. The bottle carries the words ‘no added preservative’, meaning that sulphur dioxide has not been added to the wine. The words sulpites and sulphur dioxide are often used interchangeably, but essentially sulphites are solids which can be dissolved in liquids and sulphur dioxide is a gas. Like everything, it does get more complicated than that. Sulphites are disinfectants. They kill bacteria, fungi, and yeasts. Much of what is written about sulphites on the internet varies from simply incorrect to downright nonsense. Unfortunately it is repeated uncritically to the point where it becomes difficult to discern the truth. It is often claimed that the ancient Romans and Greeks used sulphites in winemaking, but proof is never offered. Research shows that this assertion is quite unlikely. Wines of that period were vastly different to what we enjoy today, mostly being only slightly removed from vinegar. The longer lasting wines were sweet and very alcoholic. Sulphites can be added at several points in wine production – in the crusher to kill native yeasts and bacteria, later to stop fermentation, before bottling to help preserve wine in the bottle. In some countries organic wines cannot have added sulphites, in others they can. There is also ‘organic grapes’, ‘wine made from organic grapes’, and wine made with no added preservative. It is important to acknowledge however, that the natural fermentation process produces some sulphites naturally. Winemaking and grapegrowing are very complex indeed. I’m hardly scraping the surface here. Here are some: note DMDC is actually poisonous but breaks down quickly after addition. It is also used in soft drinks. Here’s a tip: the larger the winemaker, the bigger the production runs, the more additives and processing will be used.